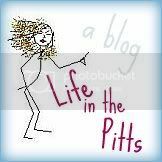 Life in the Pitts: A big surprise! Kurt walked casually into the room. "Oh, hey. look what I did." "Yeah, I booked us a cruise." "For a week and a half from now." Who does that, you guys? No one. No one but the guy I married. Aw, that's so sweet!! What a guy! That's awesome, have fun and take pictures! That is so awesome. Matt and I went on a cruise like three years ago and I still miss being on that ship. Like massively. It's heart-aching. OMG that is amazing and wonderful! Have a great time! I've never been on a cruise but hope to go someday. Looking forward to hearing all about it!